As winter approaches and the snow begins to blanket the familiar streets, city bicycle commuters must be even more vigilant for their safety as roadways can be slippery and visibility limited. During winter weather conditions, it is more important than ever to bike defensively on city streets. Motorists may be less likely to spot bikers during snow storms and may be unable to stop quickly if the road ways are slippery. 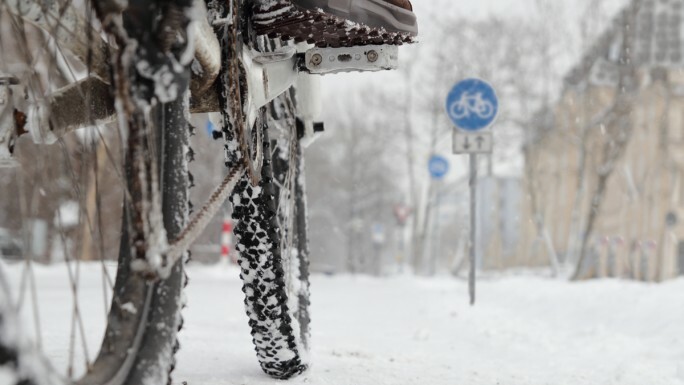 Read on to learn some helpful safety tips for cycling in the winter. Part of being a responsible cyclist is the acquisition and maintenance of proper gear. Of course, dress warm enough for the weather. There are tons of winter bicycling gear that can help ensure that you stay warm while riding in cold temperatures, including gloves and goggles. We recommend always wearing a helmet, which means being able to fit warm winter gear underneath your helmet. You should also wear bright colors or reflective apparel as to be easily seen by other drivers and cyclists. Always be sure that your bicycle is properly lighted. Pursuant to Minn. Stat. § 169.222 bicyclists are required to equip the front of their bicycle with a white lamp that is visible from a distance of at least 500 feet and either a red reflector or lamp on the rear of the bicycle visible at distances from 100 to 600 feet. As a bicyclist, it is your responsibility to ensure that you are visible to motorists. As a cyclist, you cannot control what other drivers do. Be aware of your surroundings at all times and do not assume that cars have seen you until you are sure they have. Making eye contact with other drivers is a great way to ensure that they have seen you and also understand their intention or communicate your own. Minimize distractions so that you may focus on your cycling. Although it may be nice to listen to music, never use ear buds or headphones while bicycling. It is important that you are able to hear any sirens, horns, or other signs of danger. As a moving vehicle, you are held to the same responsibilities as other drivers, which means that you are also expected to ride with the flow of traffic and follow normal intersection procedures. Always use hand signals at least three seconds before a turn or stop as to prepare other drivers to give you the space that you need to maintain a safe journey. Sometimes snow and ice can accumulate on the shoulder or create blockages in bike paths. Always be sure to observe the path in front of you and be prepared to stop or merge to avoid snow drifts or ice build-up. Other motorists may not be mindful of these hazards that you face as a cyclist, so bike defensively to ensure that you always have a safe route available. We wish you a safe and happy winter biking season! If you should be involved in a bicycle accident, we are here to help and ready to fight for you. At Lord + Heinlein, we are your powerful legal voice.